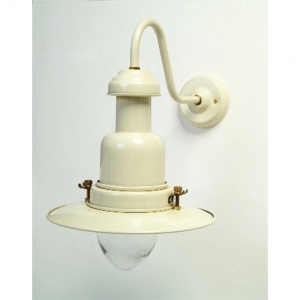 Our popular fisherman's wall lights are available in Standard or Large and all rated IP44, so can be used outdoors for traditional appearances to modern and older properties alike, equally if you have a nautical design theme you can use these indoors with matching fisherman pendants to compliment your design and with such a good colour choice set your room to great effect. 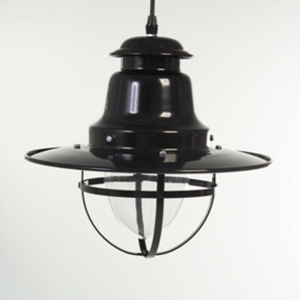 Whilst they might be traditional, all our external light fixtures can be fitted with energy saving LED bulbs, 5 watt is generally sufficient as this will give plenty of light to your garden or outside space, although you can use 9 watt if you need the equivalent of 60 watts remember light spreads a lot further outside! 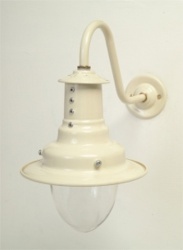 All our fisherman's lights can be matched with either the fisherman's pendant range or our Retro Kitchen light range. 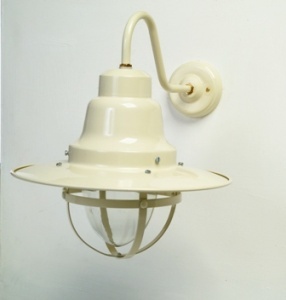 Whilst our lights are not fitted with PIR sensors, these can be supplied for fitting separately and able to control a number of light fittings if required either with LED or incandescent light bulbs. Obviously helping with security around the home, or just for the convenience when arriving home in the dark. Corner brackets are available if required. 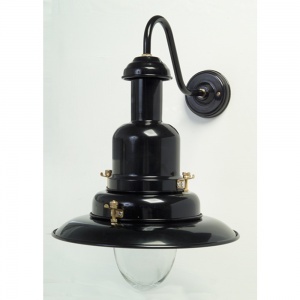 All our Fisherman's wall light range are made for you here in the UK, and our Barn and Stable wall lights are no exception, ideal for walkway and paths, they will give you good service for many years to come. 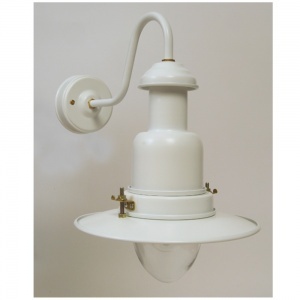 We think it is important to support British Manufacturers, crafted by hand, these lights are made in the UK. 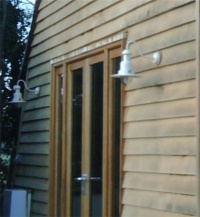 They have a distinctive quality powder coated finish. This is often called enamel, however powder coating is a heat process that produces a better finish. Making these wall mounted light fixtures by hand does take time. We estimate 15 - 18 working days to complete each batch, however the factory work hard to get your lights out as soon as possible as we know you're waiting for them. 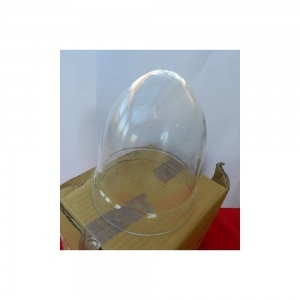 We strive to produce a stylish item that represents a quality product, as opposed to a cheaper lightweight import. 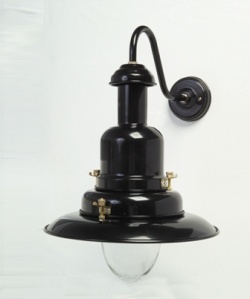 Why does making our fisherman style light fixtures take this time? 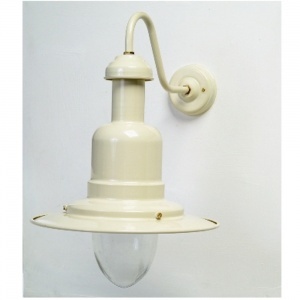 All our fisherman's wall lights are handmade, not mass produced. The body and associated parts are all hand turned from aluminium. Any necessary drilling and forming is done at this stage. The lights are then assembled, cleaned and then go to the paint process. The simple explanation (but it is a bit more involved!) 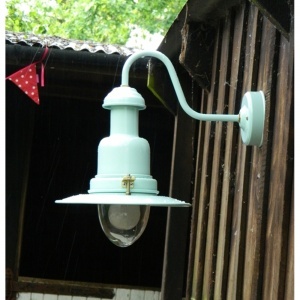 is the fisherman's light is sprayed with a special powder paint. It's then baked in an oven which 'melts' the powder giving an even finish; the process can take several hours. Given the size and expense of these ovens and spray booths, only one colour can be used at a time. This takes time to clean before a change of colour, so it is reasonable for the factory to organise same colour batches together. This can delay the process by a few days depending on what batches are going through the factory at any time. 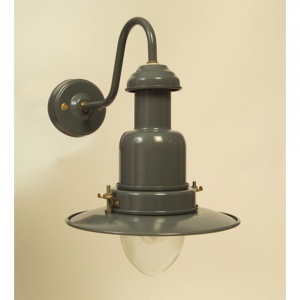 Once painted, the lights are then go to the electric fitting shop. They are wired by hand, assembled, and then go for final testing. 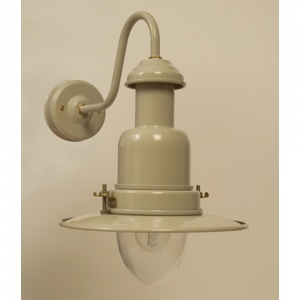 Each light has an initialled proof they have been electrically tested before leaving the factory. The finished fisherman's lamp is then wrapped, packed and sent to us. 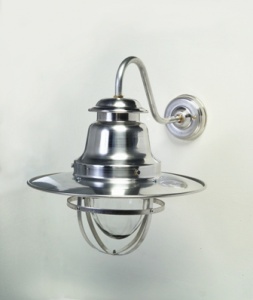 Your patience will be rewarded: whether your wall lights are to be used indoors or to light outside they will be stunning and unique. 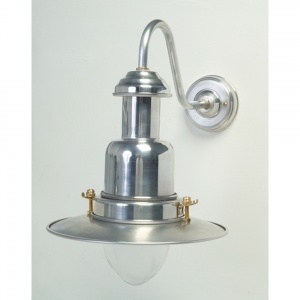 All the lights on this page are rated IP44 for outside use, but can equally be used inside with customers choosing fisherman bathroom lights, you just need to check how they will be used in your Bathroom, you can check out our guide - What Bathroom Lights in What Zones?